For other uses, see Guyot (disambiguation). In marine geology, a guyot (pronounced /ɡiːˈjoʊ/ ), also known as a tablemount, is an isolated underwater volcanic mountain (seamount) with a flat top more than 200 m (660 ft) below the surface of the sea. The diameters of these flat summits can exceed 10 km (6.2 mi). Guyots are most commonly found in the Pacific Ocean, but they have been identified in all the oceans except the Arctic Ocean. Harry Hammond Hess was a geologist and a United States Navy officer in World War II. Guyots show evidence of having once been above the surface, with gradual subsidence through stages from fringed reefed mountain, coral atoll, and finally a flat-topped submerged mountain. Seamounts are made by extrusion of lavas piped upward in stages from sources within the Earth's mantle, usually hotspots, to vents on the seafloor. The volcanism invariably ceases after a time, and other processes dominate. 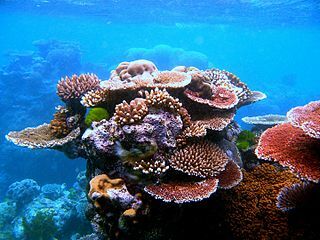 When an undersea volcano grows high enough to be near or breach the ocean surface, wave action and/or coral reef growth tend to create a flat-topped edifice. However, all ocean crust and guyots form from hot magma and/or rock, which cools over time. As the lithosphere that the future guyot rides on slowly cools, it becomes denser and sinks lower into Earth's mantle, through the process of isostasy. The Mid-Atlantic Ridge (MAR) is a mid-ocean ridge, a divergent tectonic plate or constructive plate boundary located along the floor of the Atlantic Ocean, and part of the longest mountain range in the world. 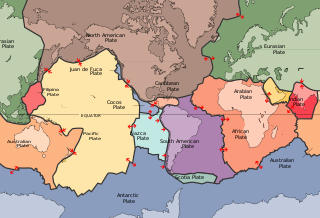 In the North Atlantic it separates the Eurasian and North American plates, and in the South Atlantic it separates the African and South American plates. The ridge extends from a junction with the Gakkel Ridge northeast of Greenland southward to the Bouvet Triple Junction in the South Atlantic. Although the Mid-Atlantic Ridge is mostly an underwater feature, portions of it have enough elevation to extend above sea level. The section of the ridge that includes Iceland is known as the Reykjanes Ridge. The ridge has an average spreading rate of about 2.5 centimetres (0.98 in) per year. Seamounts provide data on movements of tectonic plates on which they ride, and on the rheology of the underlying lithosphere. 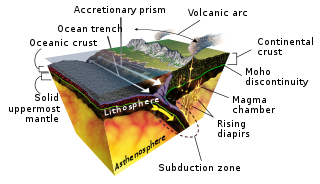 The trend of a seamount chain traces the direction of motion of the lithospheric plate over a more or less fixed heat source in the underlying asthenosphere, the part of the Earth's mantle beneath the lithosphere. There are thought to be up to an estimated 50,000 seamounts in the Pacific basin. The Hawaiian–Emperor seamount chain is an excellent example of an entire volcanic chain undergoing this process, from active volcanism, to coral reef growth, to atoll formation, to subsidence of the islands and becoming guyots. The Great Meteor Seamount, also called the Great Meteor Tablemount, is a guyot and the largest seamount in the North Atlantic with a volume of 24,000 km3 (5,800 cu mi). It is one of the Seewarte Seamounts, rooted on a large terrace located south of the Azores Plateau. The crust underlying Great Meteor has an age of 85 million years, deduced from the magnetic anomaly 34 (An34) at this location. Discovery Seamounts are a chain of seamounts in the Southern Atlantic Ocean, which include the Discovery Seamount. The seamounts lie 850 kilometres (530 mi) east of Gough Island and once rose above sea level. Various volcanic rocks as well as glacial dropstones and sediments have been dredged from the seamounts. Allison Guyot is a tablemount (guyot) in the underwater Mid-Pacific Mountains of the Pacific Ocean. It is a trapezoidal flat mountain rising 1,500 metres above the seafloor to a depth of less than 1,500 m, with a summit platform 35 by 70 kilometres wide. The Mid-Pacific Mountains lie west of Hawaii and northeast of the Marshall Islands, but at the time of their formation were located in the Southern Hemisphere. 1 2 Guyot Encyclopædia Britannica Online, 2010. Retrieved January 14, 2010. ↑ "Guyot". www.utdallas.edu. Retrieved 15 January 2019. ↑ Seamounts are made by extrusion of lavas piped upward in stages from sources within the Earth's mantle to vents on the seafloor. Seamounts provide data on movements of tectonic plates on which they ride, and on the rheology of the underlying lithosphere. 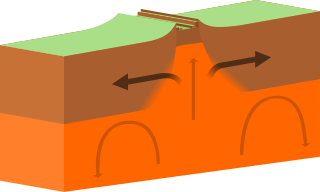 The trend of a seamount chain traces the direction of motion of the lithospheric plate over a more or less fixed heat source in the underlying asthenosphere part of the Earth's mantle. ↑ Hillier, J. K. (2007). "Pacific seamount volcanism in space and time". Geophysical Journal International. 168 (2): 877–889. Bibcode:2007GeoJI.168..877H. doi:10.1111/j.1365-246X.2006.03250.x. 1 2 "Seamount and guyot". Access Science. doi:10.1036/1097-8542.611100 . Retrieved 2 February 2016. ↑ "Great Meteor Tablemount (volcanic mountain, Atlantic Ocean) – Britannica Online Encyclopedia". britannica.com. Retrieved 15 January 2019. ↑ "Answers - The Most Trusted Place for Answering Life's Questions". Answers.com. Retrieved 15 January 2019. ↑ Harris, P.T. ; Macmillan-Lawler, M.; Rupp, J.; Baker, E.K. (2014). "Geomorphology of the oceans". Marine Geology. 352: 4–24. Bibcode:2014MGeol.352....4H. doi:10.1016/j.margeo.2014.01.011.